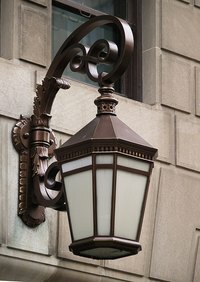 Oil-rubbed bronze is a paint finish commonly used on objects such as doorknobs, light fixtures and home décor items. The base coat is a metallic finish usually in dark browns, with an antiquing glaze over the top. You can create this look by painting with certain types of black, bronze and brown paint in layers. Paint your object with a black primer. Coat all areas. Several layers may be needed. Spray paint works well to get into all the crevices of an intricate item. Allow to dry. Add bronze paint to the object being painted. The bronze paint can be sprayed on, sponged on or brushed on. Several layers may be needed, since metallic paint can be transparent. Mix glaze and paint to form an antiquing stain. Glaze can be mixed one part paint to two parts glaze. The latex paint can be black or a dark brown. Mix well. Dip a rag sparingly into the glaze and then begin to rub onto the bronze surface. Pouncing or stippling with a dry brush also works well. Drying time is around 24 hours for glaze. Make sure the object is not touched or moved. Add a protective clear coat if necessary. A variety of glazes can be used, from deep reds to blues, for different looks.